Gt series are abit more modern than t series.. They won't hand it out, under NDA as per usual. Haven't been on in a while, but a few things have happened since my last visit. Engines been pulled out, stripped down and rebored. Got 87mm wossner low comp pistons, xud11 crank, spoox lightweight flywheel and cg stage3 clutch (all going for balancing soon). Waiting on a quote for some custom rods. Plans have changed for the turbo setup, I'll now be using 2 T28's in a parallel configuration, still sequential, so one for low rpm and both for high rpm. Got the two T28's from an r33! With only 600 miles on them since being fully rebuilt! Sorry it's been a while again guys! lifes been a bit hectic past few weeks/months, had hardly any time for the car which saddens me deeply. However I did get a little time on it today! Got the heater unit out, steering column, some sound deadening and brake servo. got a little more stripping to do in the engine bay, then that can have a lick of paint. After that I can get the subframe cleaned up and reinstalled. in the new year perhaps! Ok so I've got a week off work next week so I plan on getting lots done on this, mainly getting things balanced and bottom end rebuilt, but Im still undecided as to whether or not I should switch to a 16v head? Basically the turbos I'm using flow around 32 lbs/min at peak boost, and I'll be running 2 of them! So is it as simple as the head needs to flow at least 64 lbs/min? That's assuming both turbos do reach peak. I'll be getting the 8v head flow tested this weekend, so as long as it hits 64 lbs/min (perhaps with some porting and cam profiling), it should be good to use? My AP twin plate clutch arrived last night! Off for balancing tomorrow. Good work, would be good to see photos of the block going together. With the turbo setup, the T28's in sequencial will work, but as most have said it is an in-efficient use of that type of setup - but that being said there is nothing to stop you upgrading turbo's later down the track once all fiddling is ironed out block broken in etc, just make sure you allow the space/flanges/expenditure for these. It's good to keep the enthusiasm and keep the ball rolling, its a minor thing that can be dealt with when the motor is running. Well despite having the week off work for the sole purpose of working on the car, I've done exactly zero hours with it! Frustrating doesn't even come close! But I'll do some tomorrow if it kills me. What have you been doing just having tugs all day?? Came out ok I reckon, not perfect but it's not a show car so I'm happy. Picked up my balanced crank assembly yesterday afternoon and dropped off the cylinder head while I was there for porting and CNC valve contour, gotta wait about a month for that though because they've got a lot of work on. Waiting on a quote for my rods, as soon as I hear back I'll give them the go ahead but not sure on the turn around time for those. Got a fair bit of wiring to sort out as well so there's plenty for me to be getting on with! Can you not get in touch with zx_volcane he was doing the group buy on forged rods - many people have these and none have failed including his 240hp xud. Right, been a while! so a little update. Should be getting my rods at some point in the week, then at least i'll be able to start rebuilding on the bottom end, once thats done I can measure piston potrusion and order a head gasket, then rebuild top end. Should have my cylinder head back shortly as well, they've had it for a few months now! chasing them up this week. subframe is all cleaned up and ready to go, apart from I had to cut off one of the cups on the front mounting point, and cant seem to find a new one anywhere!! Grinning like the bloody Cheshire Cat this evening!! proper job, none of this chinese shite. I have a set of rods from Robson Engineering, while I do agree usual chinese stuff isnt the best, has anyone actually blew a set of the chinky rods yet? I would definitely consider them. its rpm and oil starvation that kills them, where a decent rod like a Farndon has that one small detail that is quite obvious on them addressed, there is an inherent weakness in every single example I've seen, coupled with the fact that they're made down to a price the quality control and tolerances just arent there. on the left is the remains of the common chinese rod, bearing had picked up and the rod let go big style on the cap. 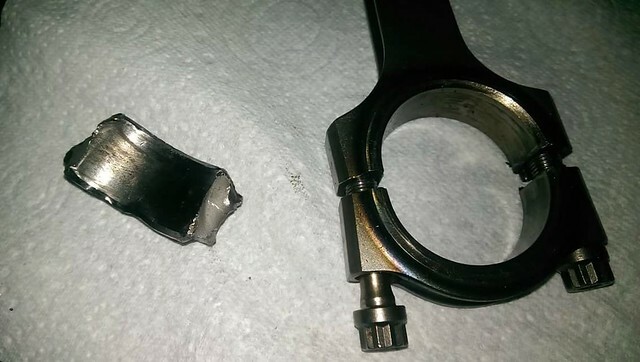 on the right is a farndon rod subjected to no oil pressure, granted it has deformed and the bolts have bent when disassembled, but this was subjected to max rpm in an n-a engine for a few laps of castle combe, if I recall all sandy needed to replace was the rod and a few valves, whereas the former was rendered essentially 100% scrap other than the camshafts due to the carnage of a flailing conrod. Who's is the chinese rod ? Was this from an XUD, I didn't know one had actually failed but interested to see what specs the block was before this happened. I think there must be varying qualities available but if it comes down to a question of strength i've seen the chinese rods pushing HP way higher than the stock XUD/HDI rods would take. The oil issue you mention above cannot be a huge problem as i've never heard anyone have an issue, but If this gets sorted I cannot see the actual strength of them being a problem if it is forged from the factory with a different design. What is the issue you mention with the oil starvation. So my kent cams cam pulley turned up today, and it doesnt have any timing marks, so i'll have to time it up from scratch. However, I cant find the angle past TDC at which the inlet is at full lift, anyone happen to know this little bit of info?